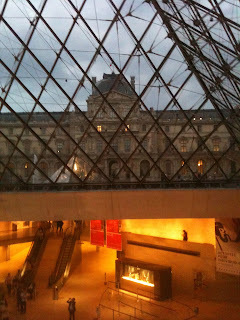 Prayers to Broken Stone...: Paris, Days 10-11 - The Louvre! Well, it's happened. I've fallen behind on my blogging. But it isn't for lack of adventures! Yesterday, I spent the evening with Eliza at the Louvre. Today, I've been working on some necessary playwriting business -- a submission package that needs to get out, and an e-mail interview that is due. It was kind of a rainy day, and I seem to have caught a bit of a summer cold, so staying in the flat with the French cats, eating baguette and Camembert cheese and scribbling seemed like a good plan. I will venture out again tomorrow. So... to recount yesterday's adventures! 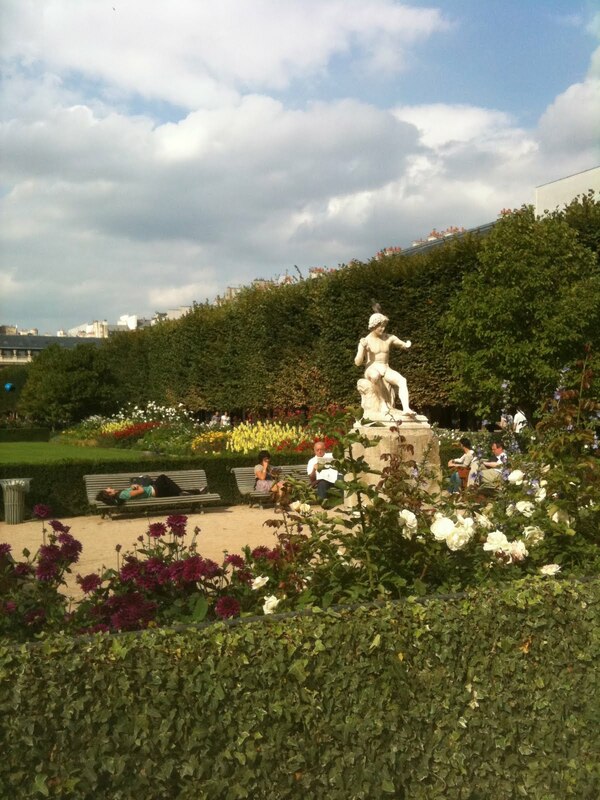 Eliza and I were going to meet at 6pm at the north end of the Jardin du Palais Royale -- which itself is on the north end of the vast complex of buildings that make up the Louvre. Our plan was to go to a little Japanese udon shop that a friend of hers had introduced her to on a previous trip to Paris, then take advantage of the fact that the Louvre has evening hours on Wednesday and Friday nights -- staying open until 9:30pm. I took off a couple hours early, though I guessed it to be a half hour's walk, at most. I wanted to give myself time to window shop and get lost and ask directions and find my way again and then sit in the garden and people watch for a while. And lo and behold... I had time to do all of those things! A statue of Moliere I ran into while I was lost. They have these things just sitting around here in Paris! 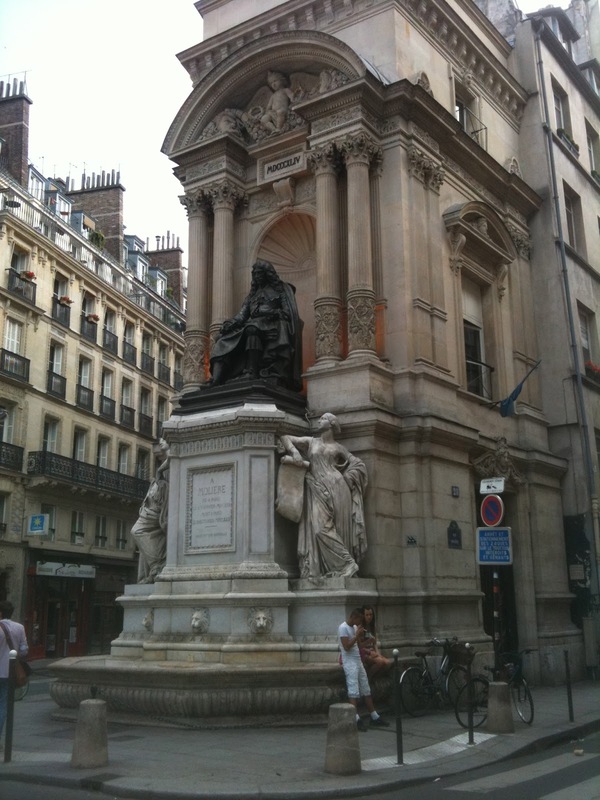 The fountain in the Jardin des Palais Royale. It is the perfect temperature for putting your feet in on a nice warm afternoon. Statue, flowers and benches in the garden. Eliza strolled up at exactly six o'clock, and we headed for the restaurant, which was just down the street. It was so much fun! A little hole in the wall. The window seat was taken, so we sat at a bar that faced the kitchen -- which was really a better place to sit, because we could watch the fellows cook up everyones' meals. The menu was written in Japanese characters, phonetically translated Japanese characters, and French. 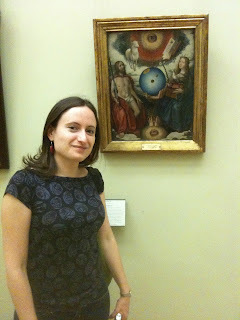 Eliza kindly translated the French bits. 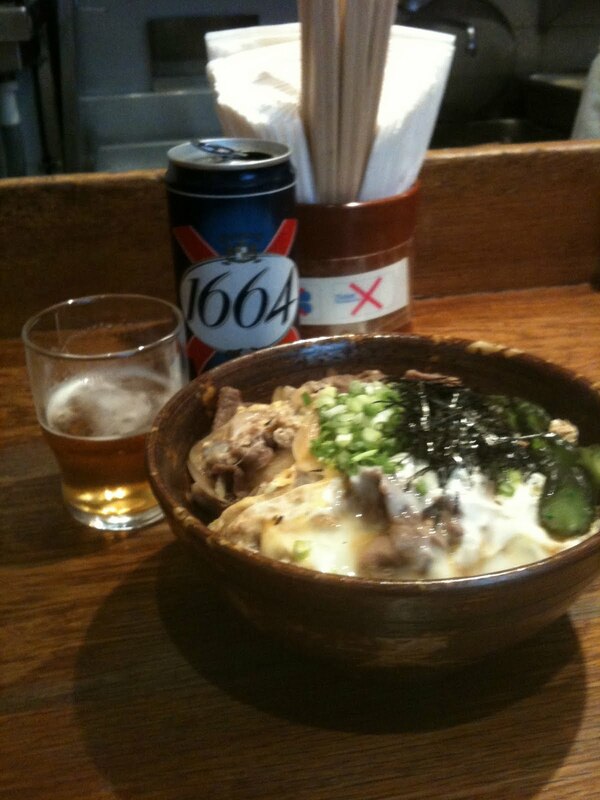 I ordered a beef rice bowl and a beer, and she had udon noodles, served on a little bamboo mat with other dishes of things that she was supposed to alternately sprinkle from and dip things into. (They were out of the sweet tofu that she'd had there before, so she was being adventurous.) 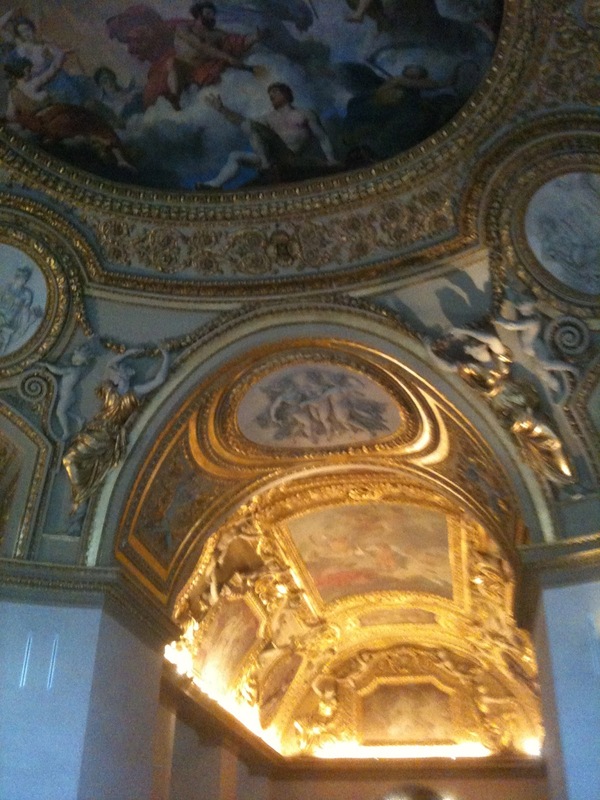 It was a nice, filling meal, which fortified us for our time in the Louvre. My beef and rice bowl (with an egg on top), and a beer. 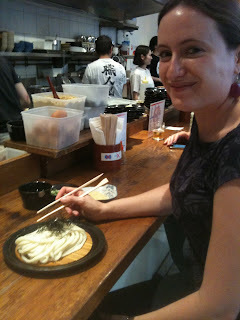 Eliza's cool udon noodle dish. 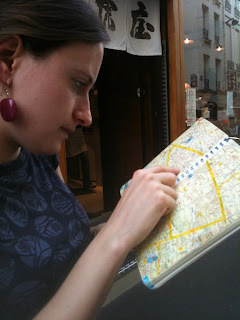 Eliza checks the map, as we try to find our way to the Louvre. We had the happy surprise, when we reached the Louvre, that tickets were only ten euro. We figured it was because we were there in the evening, for the special evening hours. 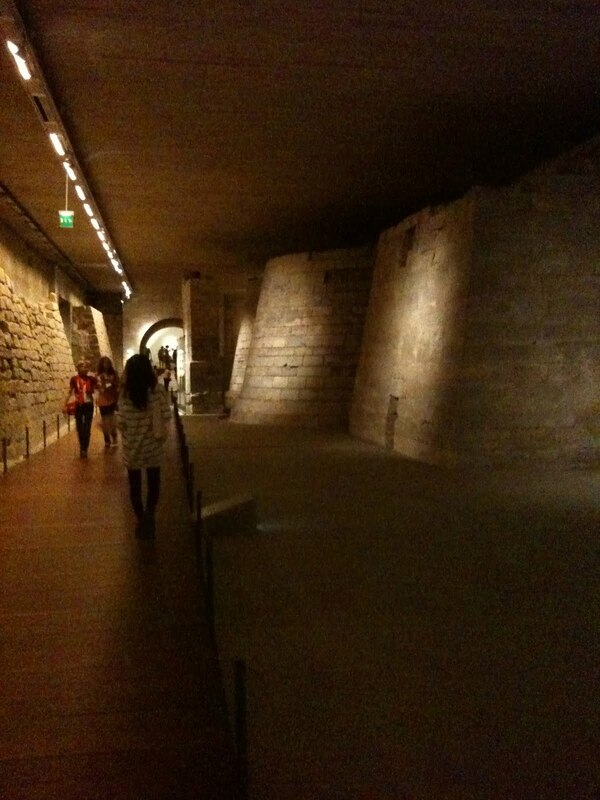 The line wasn't that long, and soon we found ourselves descending through the great glass pyramid, into the Louvre. We grabbed a map, and decided on your basic "Mona Lisa first, then top-down" strategy. It felt like there was more art there than you could see in a lifetime -- and at any given moment, they are only displaying a small fraction of all they own. We grabbed a map, and started our search for Mona. Despite there being a whole bunch of signs, it took us a bit to find her. I just can't explain how vast the place is. Five floors, and each with room after room of art. The Mona Lisa. She was surrounded by her adoring fans, but I elbowed some of them out of the way to get this shot of the lady. 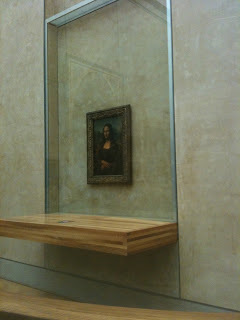 Cool to see her in person -- but the protective glass and fencing put too much distance between us. 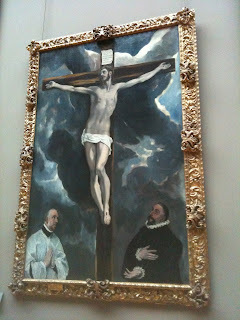 I like to see the art a little closer up. I liked this gal much better. 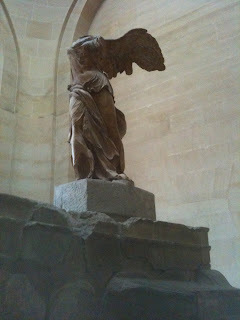 Winged Victory of Samothrace! 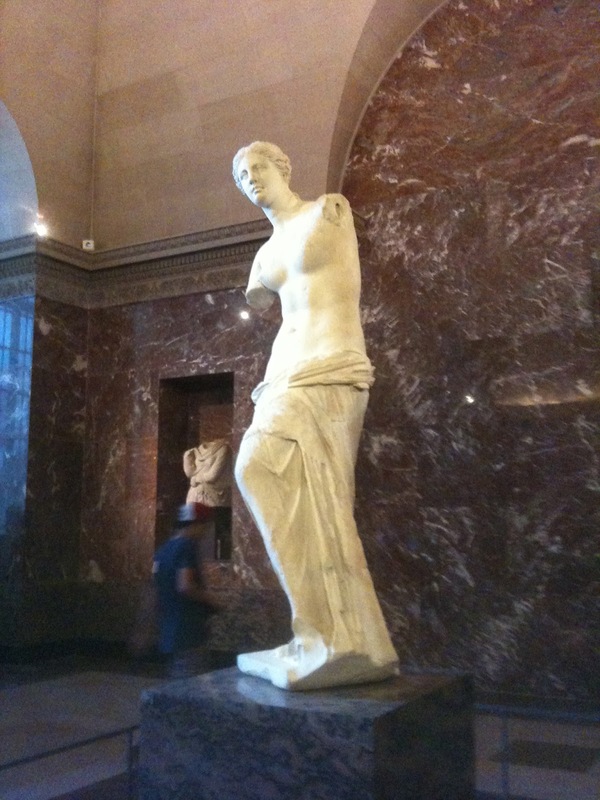 She dates from the 2nd Century BC. 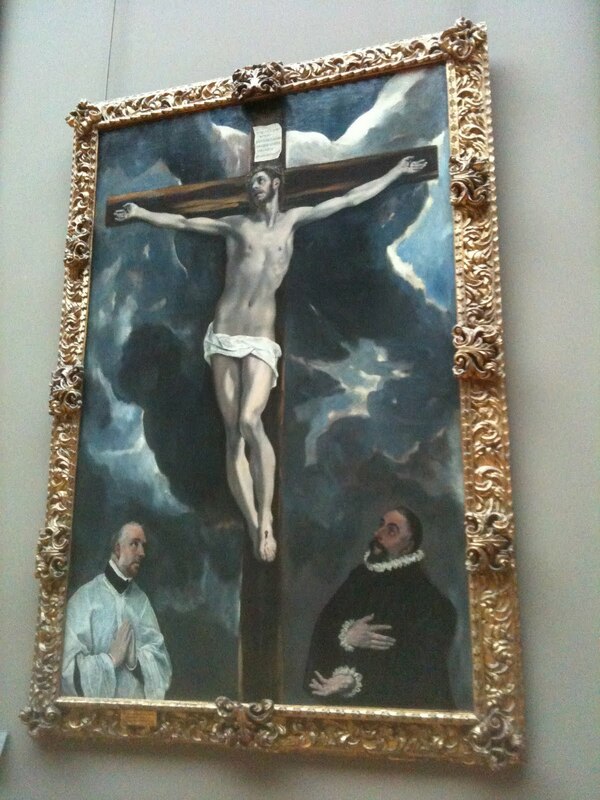 An El Greco, I do believe. Venus de Milo. Very pretty! 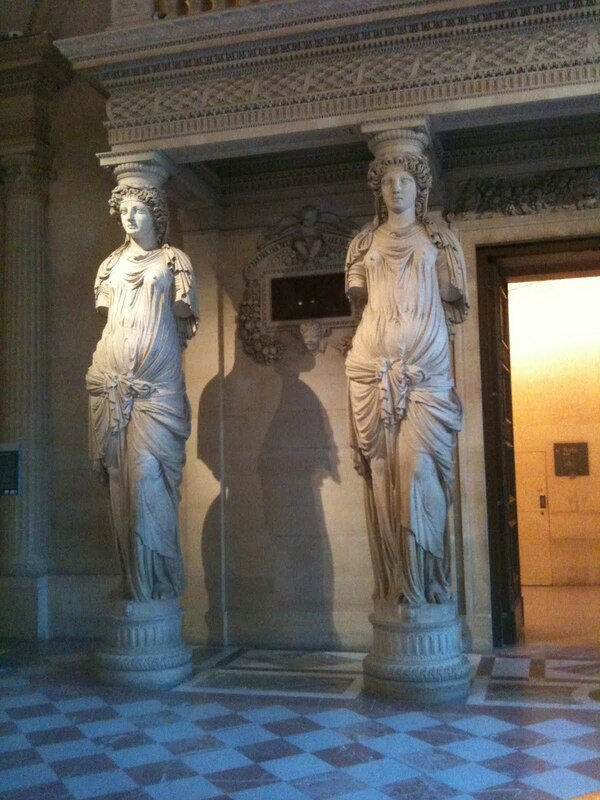 A doorway in the Louvre. 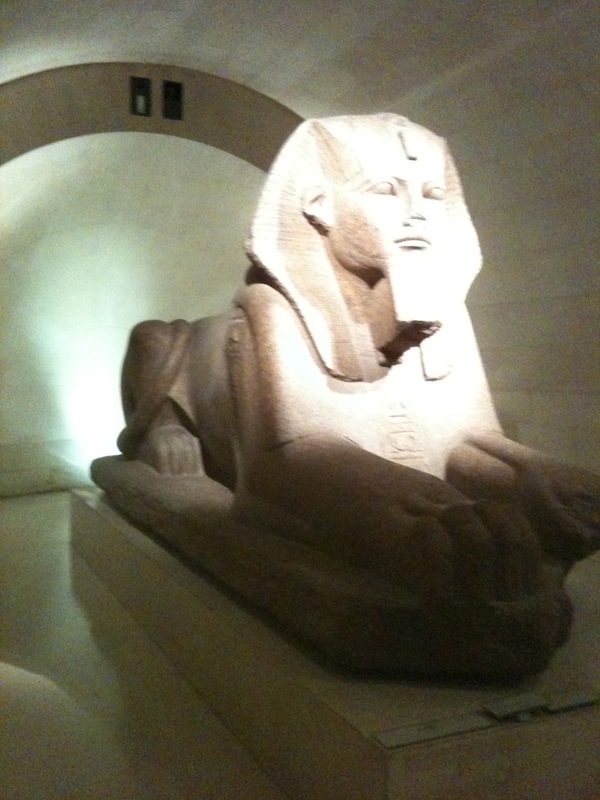 A sphinx guards the Egyptian antiquities. The medieval portions of the Louvre are still visible down on the lowest floor. Again, one thing was built on another. 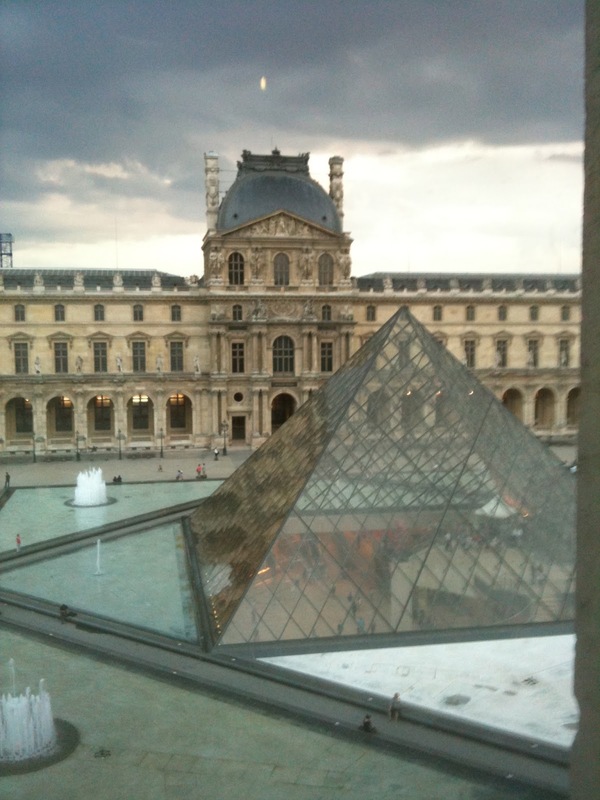 It was a dark and stormy night over the Louvre. Eliza and the crazy Medieval painting. 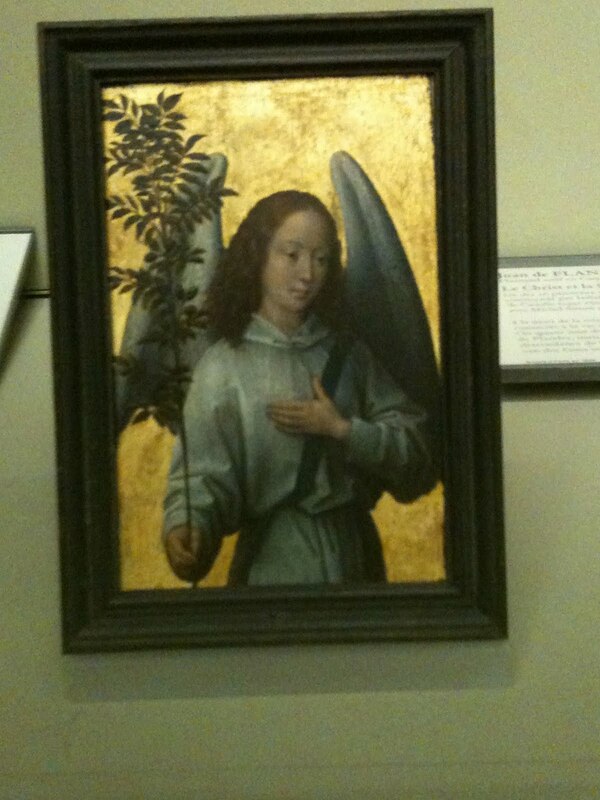 Very handy to have a medievalist with you when touring the Medieval portion of the Louvre! Upstairs; downstairs. 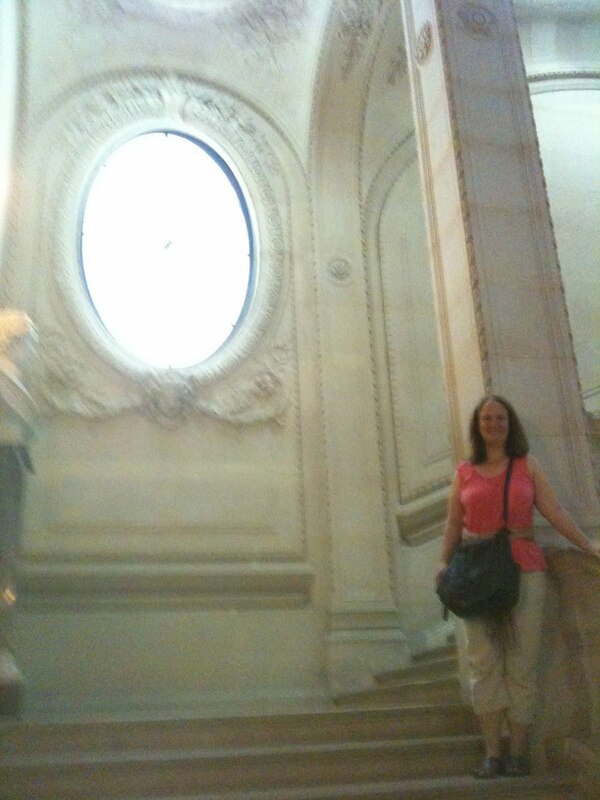 Going up the escalator after our time at the Louvre. Home at the flat with the cats. Don't be fooled. They are not as innocent as they look! We saw many wonderful things, and I hope to go back again this Sunday -- which is the first Sunday of the month, when many museums are free. I'm sure a lot of other folks will have the same idea. But I'd love another crack at the place. Must sleep now. Tomorrow, I have to pick from my list which wonderful new thing to go and see. And, perhaps, to use Google Translate to figure out the French word for "Dayquil..."